The Abundance Project is a community based organization focused on promoting healthy eating, sustainable growing practices and food preparation skills. The Abundance Project strives to involve people of all ages and genders in the pleasures of good locally grown and prepared foods. Most events are held in the St. Paul’s United Church kitchen as it is the largest health inspected and approved facility in the community. 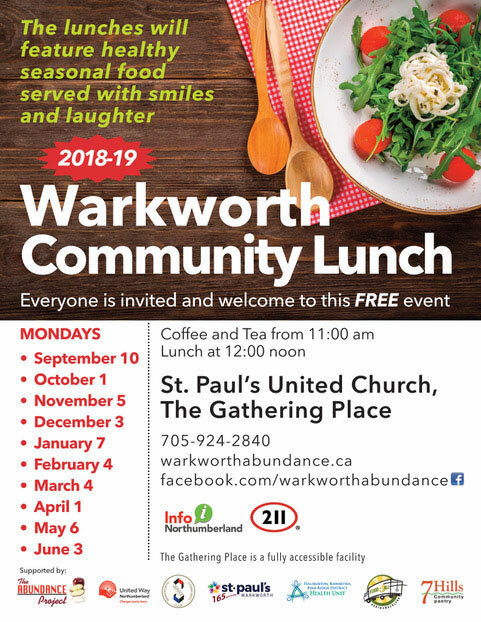 All Abundance Project events are open to every member of the greater Warkworth community. To promote community wellness by developing direct links between producers, preparers and eaters and thereby establishing a local healthy food culture that has a positive economic, social and environmental effect. Note: There are currently no Abundance Project special events scheduled. Please check back later. Copyright © 2014-2019 The Warkworth Abundance Project. All Rights Reserved.